Previously, on MinerBumping... Agent Bob the Fourth arrived in the Solitude region like a thunderclap. As non-compliant carebears died one after another, the miners were at first shocked, then angry. Finally, they'd had quite enough of Bob. When Chance Mayfield's mining Mammoth was ganked, a rebel named Furbie quietly vowed to avenge him. Furbie > wat ship is bob in? Chance Mayfield > It was a Coercer. Bob the Fourth > This is a good start, But you really will need to buy a permit and follow The Code if you want to continue to mine here. 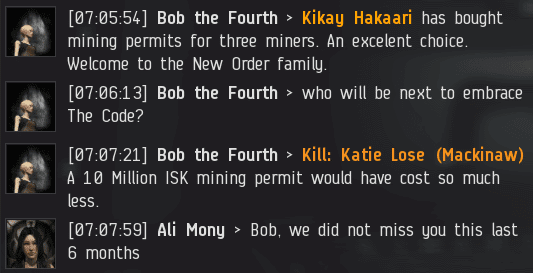 Agent Bob was pleased to see a higher level of engagement from the miners--most of whom preferred to spend their EVE sessions AFK. Chance Mayfield > Lol. I do not mine much. I like to kill for bounty's. Chance Mayfield > Your next. Bob the Fourth > Furbie , you'll need a permit too by the way. You can forward me your payment now if you like. The sound of treason echoed across the system as the miners openly declared their intention to retaliate against Bob. Our Agent stayed cool. Preternaturally cool, some might say. Bob the Fourth > Kill: Chance Mayfield (Mammoth) come on now Chance, you were asking for it with that fit. Chance Mayfield > It is a 0.6 sec. leave a ship alone. The rebels didn't want to live in a highsec where PvP could happen at any time. They wanted total safety, and the only way they could get it was to kill Bob. The hunt was on. Bob the Fourth > it belongs to James 315 so permits are mandatory. Bob the Fourth > Hmm, I think someone needs to go off and reread The Code. I'm sure that would help with your rebelious nature. Chance Mayfield > I think someone needs to leave other people alone or leave the system. Bob deployed a tactical name-drop. The name of the Saviour of Highsec did its work: Furbie was confirmed to be a mad rebel. tezbagoss > code - you loser. Chance Mayfield > That is nice. But as I have already said. I AM NOT A MINER. Chance Mayfield > A miner is a person who does it for a living, or does it often. Not someone who has done it two times in a month. Chance complained about being labeled a miner because he only mined twice a month. I've heard miners use this excuse before. No matter how rarely they mine, they always manage to get caught mining. Must be bad luck. Bob the Fourth > I think we can all agree that given your constant admissions of guilt, it's time you paid for your permit Chance Mayfield. 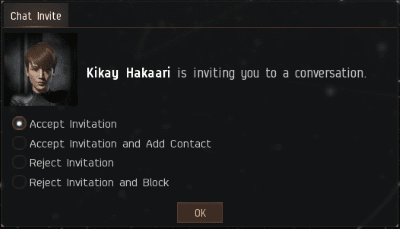 Please send me the 10 Million ISK you owe me. Chance Mayfield > lol. You are full of it. Watching Bob gank Chance and then rhetorically gank Chance again during their debate made Furbie's blood boil. He was ready to strike. ...Or not. Furbie's ganking Golem failed to take any action. Bob was free to enforce the Code at will. 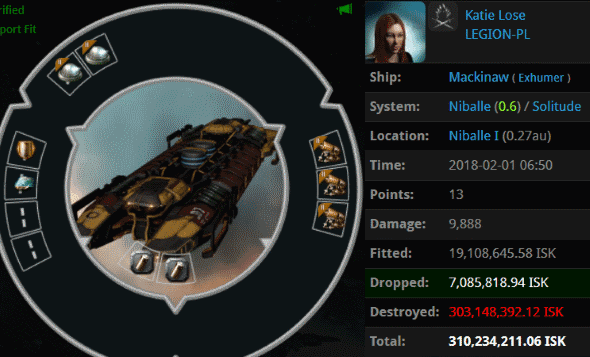 The next ship to taste Bob's justice was a fail-fit Mackinaw piloted by the aptly named Katie Lose. Bob's triumph immediately attracted the attention of a doe-eyed newbie, Kikay Hakaari. But was she really new, or was this just a routine? Kikay sensed the tension in local between Bob and the Mackinaw pilot he'd ganked. Should she listen to the miner, or should she heed the advice of the Agent? Kikay discretely opened a dialogue with the Agent. Easiest three permits Bob ever sold. Clearly, this miner had not yet been poisoned by the resistance and their lies. Bob proclaimed yet another triumph in local. It was good to be back. They should have bought a permit. Swimming pools in HiSec do also need mining permits. 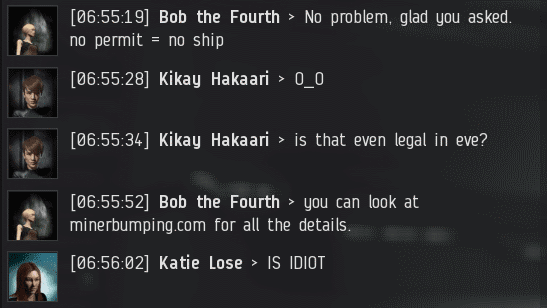 Jeezus people, EVERYTHING in highsec needs a permit! How's those kids of yours Wolf? Not that you ever see them. I'm sure his kids are alive and well. Unlike shardani's kids. All New Order agents are experts at balancing real life and their video game lives. I missed Bob! Sell -all- the permits! There's nothing quite as lulzy as a pissed off, impotent highsec shitter. "I am not a miner, I only mine once or twice a month." Being called a goatf*cker and a miner are very similar things. 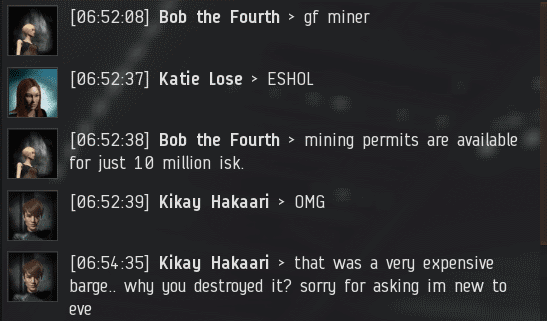 If you want to be on the safe side, just stay away from mining altogether. And stay away from the goat pen as well.